I left my home-QTH in very cold weather and in a snow storm the last days in November 2010. Because of a airline strike and because of delays I was more than one day late, when I finally arrived at Bermuda after midnight, and was met by Ed. When I woke up my first morning in Bermuda I could notice that the weather was fine, the apartment was perfect with a nice view. I really was very pleased that Ed had the equipment set up in the apartment, and I did go on the air at once. One CQ created a huge pile up from Europe on 14260 kHz. As I like pile ups, I was more than satisfied! The A4S antenna was very good and the FT-920 also a very good transceiver. 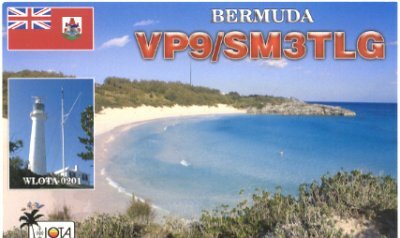 My radio activity from Bermuda was like this: Working mainly stations from Europe in the mornings on 15 or 20 meters and then I worked 40 meters with the dipole antenna in the evenings, mainly to Europe and to North America, and also got very good reports. I was also glad to be able to give quite many HAM:s in Europe with simple antennas a new DXCC country. In the afternoons I experienced the beautiful island of Bermuda. Ed was a perfect and kind host and took me to places like Hamilton, St George's and also to St David's Lighthouse, as I like to take pictures of lighthouses. I was also impressed by the very good bus system usually going every 15 minutes to almost every part of the island. So I went by myself to Gibb's Hill Lighthouse and visited the beautiful beach at Horseshoe Bay. My QSL-card will have pictures from Horseshoe Bay. I also took the ferry to The Dockyard. So after a not so good start with my flights, it turned out to be a perfect holiday for me. A mixture of radio activity (almost pile ups all the time) and sightseeing. I made around 1.500 QSO:s in a few days. Many thanks to Ed VP9GE for your kindness and great hospitality. You are a perfect host, and I realize why so many HAM:s return to your apartments. I also hope to be able to return soon again.